For this modality the generated alignment should be an optimal solution to the matching problem with respect to both recall and precision with respect to the 2015 reference alignment. As in 2014, instead of repairing the reference alignments as normal by removing mappings leading to unsatisfiable classes, we flagged the incoherence-causing mappings in the alignment by setting the relation to "?" (unknown). These "?" mappings will neither be considered as positive nor as negative when evaluating the participating ontology matching systems, but will simply be ignored. This way, systems that do not perform mapping repair are not penalized for finding mappings that (despite causing incoherences) may or may not be correct, and systems that do perform mapping repair are not penalized for removing such mappings either. The evaluation of Modality 1 will be run with support of SEALS. This requires that you wrap your matching system in a way that allows us to execute it on the SEALS platform (see OAEI 2015 evaluation details). For practical issues and in order to keep a comparison with previous years, the given Precision and Recall when running a system with the SEALS OMT client will be with respect to the 2013 reference alignments. To get the Precision and Recall using the 2015 reference alignment (i.e. ignoring mappings flagged as "?") we provide an additional and very easy to use evaluation framework. 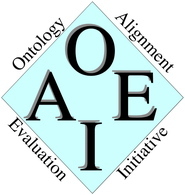 The complete datasets for the OAEI 2015 campaign can be downloaded as a zip file (LargeBioMed_dataset_oaei2015.zip [17Mb]) or accessed via the SEALS platform (see dataset identifiers below). Mapping repair systems are also welcome to provide a revised version of the original UMLS mappings to contribute in the creation of future reference alignments. Currently, Alcomo, LogMap and AML have contributed in the 2015 reference alignment.